Before you consider planting tomatoes, it's very important to know the average last frost date for your area plus the current daytime and nighttime low temperatures. Check the Internet, Farmer's Almanac, your local garden center or ask an experienced gardener for recommended plant dates. When the average frost free date has arrived, and the soil temperature has reached 50 degrees F it's time to move your plants outdoors. One week before, it's a good idea to "harden off" the young tomato plants by placing them in a protected spot like a cold frame. Move them outside during the day and into the garage at night. This process will help the plants withstand unpredictable weather conditions. Finding a sunny location is the most important consideration when planting tomatoes. Eight hours of direct sunlight is ideal. If your garden or patio is obstructed by vegetation or buildings and there is no way to get eight hours, you can actually still grow tomatoes in as little as three hours of sunlight. However, those plants won't produce nearly as much fruit. Plant tomatoes near a reflective wall. Plant tomatoes on a southerly or southeasterly slope. 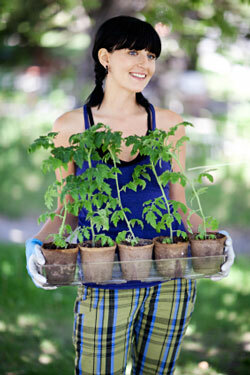 If growing tomatoes in containers, rotate the containers to sunnier spots if possible. Your soil for tomatoes is the second most important location consideration after the amount of available sun. Avoid tree roots when choosing your location. Shallow-rooted trees such as plums, maples, willows, and poplars will spread their roots all the way out to the extent of their branches. These roots will steal the moisture and nutrients from the soil. If you must plant near these trees you could dig a 3-foot trench and line it with an impenetrable sheet of metal or plastic to block the roots. Is there a best time of day for planting tomatoes? It's less of a shock to the tender tomato seedlings if you plant them when the sun isn't bearing down. If possible, transplant the seedlings into the ground in the cool of the evening. If the soil is dry moisten it prior to planting. How deep should I plant tomato seedlings? Because feeder roots will form anywhere along a tomato stem, it's smart to get a strong root system by planting the seedling's root ball about three to four inches below ground in a small trench. 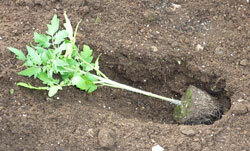 Remove any leaves that would be buried, and lay the bare stem along the trench. The goal is to grow a six to eight-inch root ball. Gently lift the top of the plant so that at least a few inches of stem with leaves remains above ground. Don't worry, the top will straighten itself out in a few days. Developing a strong root system will pay dividends in a more vigorous plant later. Fill the trench with soil and firmly press to ensure the soil is in contact with the roots. Planting in a shallow trench is particularly good in cool climates because the soil nearer the surface is warmer. If your tomato seedling is already good sized, such as those in 1-gallon pots, then instead of trenching you can plant deeply in an upright position. 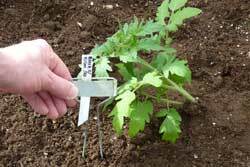 Don't forget to label the variety when planting tomatoes; you'll want to know which varieties grow best in your garden. Leave a slight depression in the soil at the base of each plant to catch water. Water your seedlings right after planting with diluted seaweed, fish emulsion, or tomato fertilizer solution. Once planted, watering your tomatoes becomes the most important facet of caring for your plants. sturdy cages from the Burpee company. Shield newly planted tomato plants from harsh direct sun for the first few days with overturned pots or row covers. Prepare to protect the plants if there is a possibility of late frost. 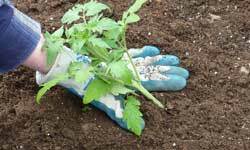 Fertilize the soil a few days before using tomato fertilizer. Moisten the soil if it's very dry. Remove any blossoms from seedlings. Space plants 12- to 18-inches if staked, 3-feet apart if unstaked, in rows 3-feet apart if staked, 4-feet apart if not. Make a 3- to 4-inch trench, remove leaves and bury 6-inches of stem in the trench, or upright if transplanting from a larger pot. Fill the trench with soil then water with a fertilizer solution. Place a label marker near the plant to identify the variety. Prepare to use frost protection practices if cold nights threaten. Follow the above steps and you will be off to a great start!